Warmest greetings our dear friends, in Jesus’ wonderful name. We thank our God upon every remembrance of you and rejoice that we have been able to work together again this year for the furtherance of the Gospel. Though I have been sick for much of the year, we are still celebrating in all that the Lord has done! Also, we are both so happy to be well enough to be back on the road again full time! This year has been a difficult year due to the health issues. Though unexplainably sick, (with what we thought was just exhaustion) I was still able to preach in Vermont, Massachusetts and Maine in the month of January. In February, (though feeling worse than in Jan.) we shared in churches in Va, Ky, Ga. and Florida. We also shared a couple of times at the Boyd county jail while there in Ky. While in Florida, in March, we spoke at First Baptist Churches in Orlando and Dunnellon and did a huge father and son retreat in north Fla. with 180 men and boys with 7 men praying to receive Christ. 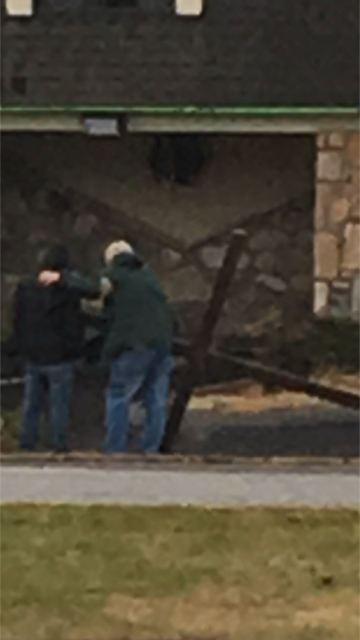 (Even had 1 young man go home and build his own cross to carry which his mother sent me a Picture of that, so I posted it on my Facebook page…) Then we shared in another church in Ga., at the end of the month and while carrying the cross there, a young black man pulled over. As I shared the Gospel with him, he wept as he reached out to touch the Cross and gave his heart to Jesus!! We talked a bit more and he said I’ll be right back. He jumped into his car, dashed off and came back with his grandmother! She hugged my neck with such warmth and joy as we rejoiced together over her grandsons salvation!! April, we went to NC to try to rest as I was feeling even worse. 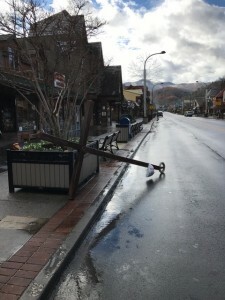 I carried the Cross some and spoke in one church but by the end of the month I was feeling so bad I had Doreen take me to the ER in Asheville. They said my blood tests showed something was up but they were not sure what with out further tests. (They suggested I return to my primary Dr. In Albany NY). May, I had not improved so we went back home. I stopped in Ky on my way through where I was able to speak at Boyd County middle school to the youth group there. I also made several visits to people we have been ministering to through the years. One that was really special was a man that had visited with us at FFBC after he got out of prison….. Danny, Pastor Jim, Deacon Dave, Doreen and I prayed with him and laid hands on him, asking the Lord to reveal himself to him. That was approx. 3 years ago. Well last year He gave his life to the Lord and is totally excited about what Jesus is doing in and through his life… He posts messages and scriptures all the time on Facebook and is attending a church over in Ashland. Much of June and July I was sick and seeing Dr.s. (The Lord provided Doreen with 5 different jobs through the time I was sick which is an amazing testimony all in itself!) I was asked to be on the board of directors of a prayer ministry in Maine and so we made a trip up there. I also found myself doing much counseling and encouraging with friends in Massachusetts where I once pastored .. In August, my health began to improve as slowly as it had deteriorated at the beginning of the year. Friend from a church that had closed 2 years ago asked me if I would be willing to use their building to do a Coffeehouse night like we use to do so successfully before. I agreed and we scheduled it. God started bringing people from out of everywhere to be a part of it. I trained people how to share testimonies, we scheduled music besides Doreen and her singing partner Dianne and set up a prayer room and had a marvelous evening we called “Praise Unleashed.” We had more people there that night than had been in that church at one time in over 20 years. Glory to God! Doreen and I also made a trip back to Maine for the launch of the Prayer Room of Southern Maine. The ministry has rented a suite that is used exclusively for prayer, intercession and healing. God has been blessing it mightily since it opened. I pray with people everyday on the road, if not for salvation, for revival or personal struggles. Also earlier this year I was asked by my friend in Belgium, (who I prayed with to receive Christ) who was doing a piano concert, if I would record a “greeting to the people of Belgium” from the side of the road with the Cross. He wanted to show it before the concert, since many of them that would be at the concert, had seen me with the Cross when I was there 4 years ago. I was certainly glad to do that! One other thing, The Lord opened the doors for a jail ministry in Franklin NC as well and it has been amazing! Doreen goes Friday evening and I go on Tues. We do not have the freedom there yet, as we have at Boyd county jail in Ky, where Doreen and I can go in as often as we want and minister together as long as we want. Nor do they let Doreen bring her guitar in yet but we are praying for favor in all that and we would appreciate y’all’s prayers for that as well! We left NC the first of Nov. to carry the Cross in southern Alabama. It was a great joy to carry the cross all the way across to Alabama. Many people stopping to talk and for prayer. I also got to share at the devotional time in a rescue mission ministry in Bayou Labatt tree, that was a special morning and a wonderful time of rejoicing in the Lord. One special visitor that I had that pulled over that saw me on the side of the road was LISA from The TV show Duck. I guess though the greatest joy of that leg of the trip was being able to reconnect with my cousin Wayne. That was truly a highlight for the year for me. I hadn’t seen Wayne in 25 years. 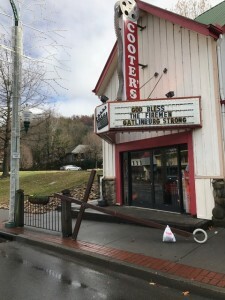 In December Doreen and I went through Gatlinburg Tennessee. Many of the fires weren’t even out yet. 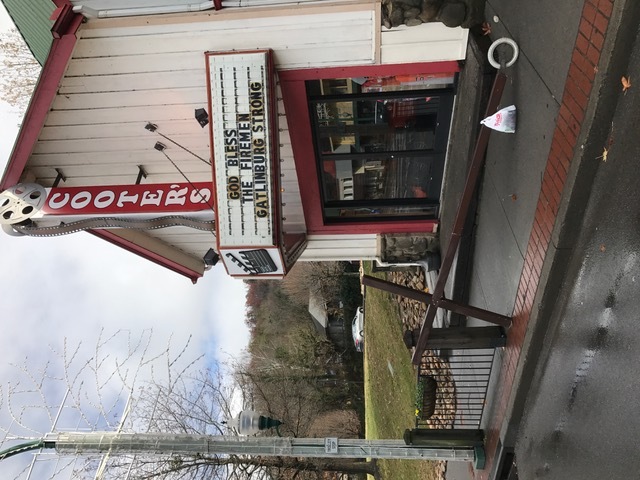 With all of the destruction that was there. 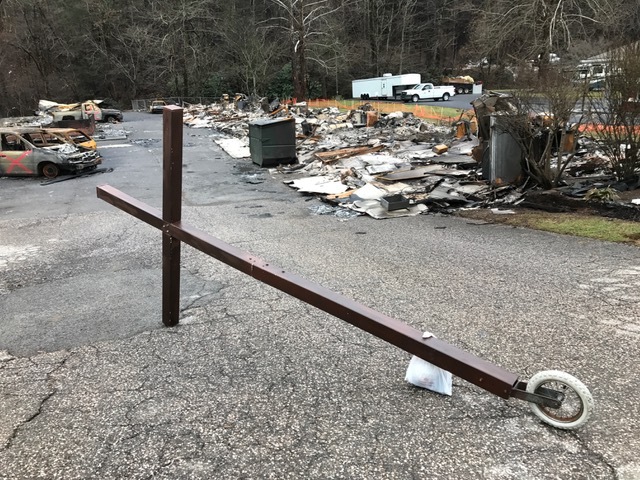 I was blessed to get to carry the cross in the midst… I prayed with the number of people that were still in shock from the fires and loss of everything. You’ll see me praying with one man in the pictures below. Buildings were still smoldering, fire crews were fighting up in the forest still when I arrive there. 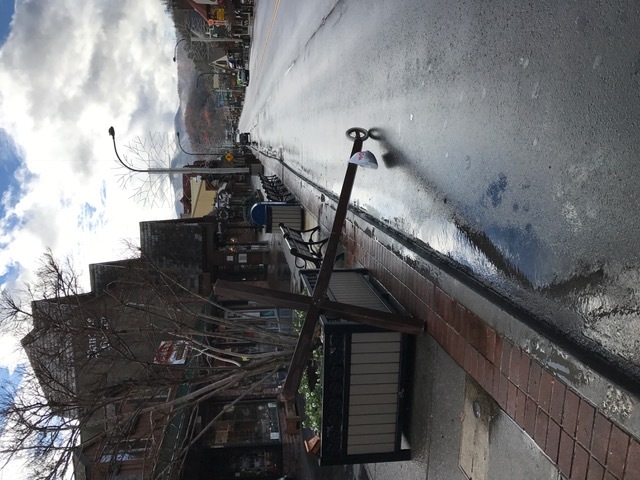 Police blockade’s were turning people back not letting them in to the town but when I walked up with the cross they said to me “they need you down there and Gatlinburg keep on walking with the cross” and they waive me on through. Truly it was a divine appointment and a chance to minister to so many that were hurting. At the end of the day Doreen and I went to the Red Cross shelter put up a “stop for prayer sign” to talk with people Who were still struggling and stunned with what all had happened. 14 people lost their lives in those fires hundreds of millions of dollars in damage and the toll will be mind boggling. 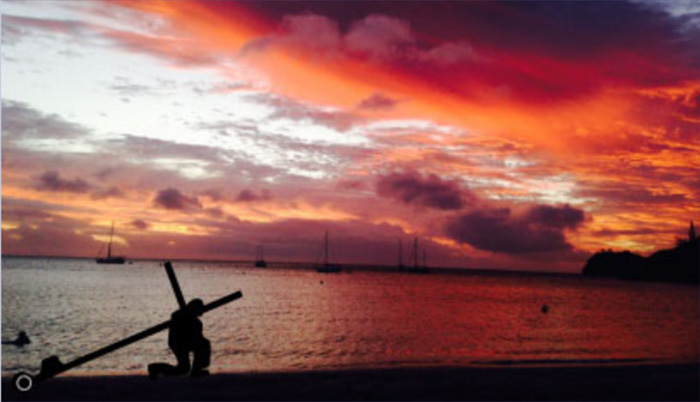 But because you all cared and helped me go, the cross was there and brought hope. I also believe that somehow God will give them beauty for ashes as he promised in Isaiah 61. 2016 will be a year that will linger in my mind for many to come and I give Him all the praise and the glory and the thanks for allowing me to experience all that He did. Praise the Lord!! Just remember, All of us working together, (whether you’re walking praying or giving financially to keep the cross on the road ) we do it as a team and we do what we do that others may live Eternally!!! God Bless you richly. For those that follow and help this ministry, Thanks for holding the Rope for us! If you would like to help us financially you can go to my website below and go to the donate page and give through PayPal or one of the other methods listed. Now In 2017, let’s keep our eyes focused on the Lord, love one another and tell the world about Jesus!